When he ran for reelection in 2012, Barack Obama never talked about gun control. That’s almost hard to remember now, after Newtown transformed Obama and he spent massive political capital trying to make Congress act on comprehensive reform. While Obama has since pledged not to even campaign for Democrats who don’t support gun-control legislation, his speech at the Democratic convention in Charlotte four years ago never alluded to gun violence. This was no small feat, considering mass acts of gun violence shook the country throughout the summer of 2012. After the Aurora, Colorado, theater shooting in July killed 12 people and wounded scores more, Obama said only that he wanted “to arrive at a consensus around violence reduction—not just of gun violence, but violence at every level, on every step, looking at everything we can do to reduce violence.” He proposed no new gun reforms. Less than a month later, when six people were shot and killed at a Sikh temple in Wisconsin, Obama again declined to make gun safety a campaign issue. Reporters asked White House Press Secretary Jay Carney if the president wanted new laws, and Carney essentially said no. “We need to take common-sense measures that protect Second Amendment rights and make it harder for those who should not have weapons under existing law from obtaining weapons,” he replied. The upcoming presidential election will be dramatically different, as dueling speeches from Donald Trump and Hillary Clinton this past weekend demonstrated. Like few other elections before it, 2016 will feature gun control as a huge and explosive issue. For months, Hillary Clinton has made guns a central theme of her campaign. One of every fourtelevision ads she ran in New Hampshire were about gun control. She has regularly met with victims of gun violence, particularly mothers, and unveiled a comprehensive gun-control planlast October. This is the toughest stance of any Democratic candidate since at least Bill Clinton in 1996, who invited James and Sarah Brady to speak in prime time at the DNC, though Hillary’s proposed reforms are much more far-reaching. Beyond the policy merits, her team clearly saw this as a political winner against Senator Bernie Sanders, who has a checkered voting record on gun rights and hasn’t yet bothered to release a gun-control plan, despite promising to do so. And it may continue to be a winner against Trump—wide majorities of voters favor universal background checks for gun owners. Gun control is a big issue for several critical demographic groups, including independent women voters: 51 percent want stronger gun laws, while only 6 percent want laws to be weakened, according to polling from the pro-reform Americans for Responsible Solutions. Sixty percent of women voters overall want stronger laws. Don’t be fooled by the clumsiness of that attempt. 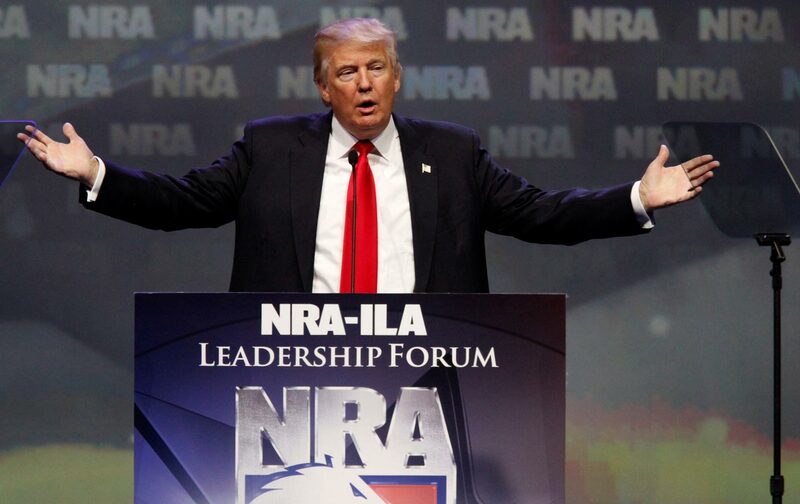 During his speech to the NRA Trump also proved adept at exploiting the deep undercurrents of xenophobia, fear, and aggression that have long underpinned the modern right-wing gun movement. Several times, my hair stood up. GET A DIGITAL SUBSCRIPTION FOR JUST $9.50! When these two candidates meet in the general-election arena, the NRA and the burgeoning gun-reform movement will have the two strongest respective champions imaginable. It’s hard to say at this early vantage point how the debate will play out, and to whose benefit, though based on polling around the issue, I’d bet Clinton. But the gun control debate is also vulnerable to rapid (and unpredictable) shifts in public opinion because of high-profile shootings. If something like Aurora were to happen again, you can be assured neither Trump nor Clinton would ignore its relation to gun control. Current events might make the gun issue even more volatile than it already is. And if we needed a reminder, as Trump was speaking about disarming the Secret Service in Louisville, a man with a gun charged the White House gate and was shot several times by agents. Some handgun and concealed carry students and readers have asked for my ideas about some practical solutions and tips for some different and uncommon concerns they have while carrying concealed and using handguns in general. Unusual concerns like what to do in the bathroom when carrying, how to store many holsters for easy access, a quick, low-cost concealment technique, and how to protect a gun’s firing pin when dry firing. I certainly don’t have all the answers and there are several factors and opinions involved here. Of these questions about unusual and somewhat unique handgun-related concerns, here are 4 different and special concerns and some possible solutions that might work for you. They may or may not solve it, be acceptable or even legal in your area, but here are a few ideas to get you thinking about how best to resolve these issues for yourself. What do you do when you have to use a public restroom and you are carrying your licensed concealed handgun? Well, for one thing don’t drop your gun or mag into the toilet bowl when deciding on your solution and maneuver. While this is a delicate and somewhat embarrassing topic to even bring up, it is a practical carry problem we must address. Since we all have to do it and frequently, if not a few times each day… visit the Throne Room. Now if we are out and about in public places when carrying our gun, this could be quite a balancing act with safety issues and potential legal problem. I guess avoiding the visit is best if we can when in public, but sometimes we cannot do that. One of the most legally-dangerous places to handle a handgun is in a public Throne Room because we are probably rushed to answer the call by Mom Nature, under some stress with our juggling act, and in an unfamiliar environment where it is easy to make a dangerous mistake with legal implications. Maybe you read about the lady carrying concealed with a license in Tampa recently. While in the bathroom stall her gun slipped out of her IWB holster and hit the floor, discharging a ricochet round which hit the lady in the next stall. She has a minor injury and charges are pending with the State Attorney’s Office as a negligent discharge, etc. Also, a Missouri House Speaker’s aide left his loaded gun in its IWB holster on top of the toilet-seat-protector dispenser in the Capitol’s public bathroom, but it was found quickly without any problems. Realistically these things occur so practically what do we do when carrying our gun and we must go to the bathroom? Not forget it and handle it safely for certain. Maybe you have not thought of this or experienced it… yet. It is difficult for quite a few folks to multitask and balance several tasks successfully at the same time. Situational awareness and focusing are very key. How we carry is also a consideration, like In-the-Waistband (IWB) or Outside-the-Waistband (OWB) on a belt. Some carry methods are more accommodating than others when trying to accomplish this chore. Some carry methods might immediately resolve it, like shoulder-holster, ankle, or pocket carry. I cannot go into all the possible methods and hardware involved and their pros and cons here, so I will assume you are carrying on your belt either IWB or OWB. Remember, it is important to always have a secure holster with proper retention so your gun does not fall out of it. We need to secure and protect our gun where ever we are, even when seated in the public bathroom. Also, use the bathroom before you leave to delay the inevitable in public, if possible. Here are just a few possible alternatives and suggestions each with pros and cons for you to weigh for your Throne Room visit. SAFETY FIRST ALWAYS. Your call on the best method! keep your pants down with holster and gun attached to the belt no lower than your knees and calf area; do not let them touch the (dirty public) floor. If your pants are around your ankles, folks looking for an empty stall could bend over to check availability and see your gun. put your pants around your ankles, take off your gun and holster, and lay/cradle them inside your pants; your gun will be protected from sight by others, easily available, and more comfortable; some bacteria risk from any low-level touching of the floor since your gun will weigh down your pants. put your pants with holster and gun attached to the belt at knee level and tighten your belt so it will be snug around your knees to hold your gun and holster in place. place your gun in the holster on the back of the toilet tank lid; do this only if the lid is flat and your rig will not slid off; some public bathrooms do not have tank lids; be careful since you may forget and leave your rig behind. Focus and situational awareness. fold your holster and gun still on the belt over to the inside of your pants; this can hold it in place if you have the proper retention holster; it also hides it from view of those looking under the stall door for an empty throne; not for full-size and some other guns. hang your holster with gun inside on the hook on the back of the stall door (NOT by the trigger guard and NOT only the gun); might be possible with a strong cord you carry with you in your pocket for this very problem. use a store shopping tote (canvas) bag and place your gun inside and lay it near you on the floor, with your foot holding it securely down and/or you holding on to the strap handles; could hang the tote bag on the stall door hook if secure; NOT the best option, buy an option if you carefully do it; could use double or triple-bagged plastic store bags, but be careful. use a strong lanyard clip and clip it to your skeleton hammer and hang it around your neck; this is NOT the best option but suggested to me by a reader; certainly do NOT clip the lanyard to your trigger guard; might use a variation of this and drill/punch small hole in holster and thread lanyard there and hang around your neck; USE CAUTION with this method… or ANY of these methods. SAFETY FIRST ALWAYS! Do you use another safer and better method? How can you quickly recognize and easily access the variety of holsters in your inventory for the several guns you use? Women love shoes and I very perceptively noticed that my wife has more than one pair. She has shoes on racks, on the floor in containers, and hanging from closet doors in see-through plastic and canvas storage containers. Then it hit me (she didn’t) maybe I could use one of her storage methods for my several holsters and magazines. I had my many holsters thrown together in a large trunk and my many, many mags in labeled plastic zip-lock bags. It is always a hassle when I change guns and look for a different holster for them. I get mixed up as which holster goes with which gun. Mags are not a problem because they are labeled for each gun in individual plastic bags, but the bags are all thrown together and storing the many bags is a pain. Well, I found a less than $10. sturdy, see-through over-the-door Shoe Storage Organizer for storing my holsters and even my mags. (Go to my website (bottom first page) to see the Honey-Can-Do Organizer.) I labeled each pocket with the name of the 1, 2, or 3 guns that fit in any particular holster. You do not need an individual pocket for each holster, since some fit multiple guns. I did the same thing for my many mags; matched the mags to the specific gun. Within each pocket for a gun’s mags, I numbered the bottom of each mag so I would know the newest from the oldest condition. The storage container and system work great. Hope it helps you. This is a possible need, especially for travel out of the country to third-world countries with high threat levels. I believe that this carry method is definitely not for everyday carry. I hesitate to even mention it, but thought there could be a remote special use of this method. I saw a short video of it and thought it was an optional method, a very different and long-shot carry method, to consider for certain unique situations ONLY. I see some advantages, but more disadvantages, but still want to present it as an option. In essence, you put your gun inside a store’s dark (not white or clear) plastic bag to conceal it. Your hand is gripping the gun and your trigger finger is on the frame of the gun (not the trigger) and you carry it down by your side, like a package filled with something you just bought…. or after picking up after your pooch. These sights are common, do not usually draw attention to your gun, are usually accepted by most lay people, and if required you could shoot through the plastic bag. It could work for up-close combat, tactical encounters at less than 3 yards or so. Sadly, criminals might use this method, if not for a gun for a knife. Also, its use might subject you to suspicion, investigation, and subject to a search by observant law enforcement officers or those looking for something in particular at the moment. This method may not be practical and there are some disadvantages to think about. There may not even be instances where this method is needed, because use of a proper holster or pocket carry may suffice and be more safe. Inside the bag, your finger could easily slide off the frame onto the trigger; the controls and sights are obstructed; reloading and malfunction drills could be difficult; your range of motion is hampered; plastic bags rip easily and you may expose your gun’s muzzle; it may contribute to malfunctions and stoppages; and may make you look suspicious to some. Your call for a situation that might quickly arise. Be careful. Snaps caps are the preferred way to protect your gun’s firing pin and chamber-wall edge, but if you have many guns you can go through them quickly like water. They wear easily and the rims crack and deteriorate quickly. They are caliber specific and can be for centerfire or rimfire guns. For example, you can buy a package of 5 in 9mm centerfire for about $15. Dummy rounds cost a little less and are about $9 for a 6-pack of .22LR rimfire. But there is a definite difference between snap caps and dummy rounds. Dummy rounds are used to practice safe handgun handling and are the exact size of regular rounds. They can be loaded into a magazine like regular ammo, used for loading, unloading of rounds and to test if the magazine is feeding properly, used in the chamber for safe storage of the gun, and can be used to test the extractor and cycling. But, they have no striking surface for the firing pin to impact. So, dummy rounds should NOT be used for dry firing your gun and for trigger control practice. In fact, most manufacturers state this on the back of the package and say to throw them away after 4-5 strikes because the head will be deformed. This can get expensive. Also, most are aluminum and are too hard for use other than mostly for test cycling. So, they have a use, but not for dry firing. Most manufacturers and experts say centerfire guns do not even need to be used with snap caps. After many uses of the centerfire snap caps over much time, some even say they may lead to harm in some key parts of your gun. I have not experienced this myself. Most if not all “experts” say it is very important for RIMFIRE guns (e.g. .22s) to definitely use snap caps when dry-firing them. I agree with them. The Smith-Wesson website says that dry firing a .22 rimfire pistol or revolver is not recommended because it will damage your firing pin. I know that I would never dry fire a .22 gun nor even regularly a revolver that has a hammer-mounted firing pin. Snap caps are low-cost insurance for rimfire revolvers and pistols. Here’s another option. Although relatively inexpensive, since you must use so many, consider using common, readily-available wall anchors in a size that fits your gun. For example, for .22LR rimfire pistols, I use #4- #6 7/8 inch wall anchors from Home Depot. About $4.99 for a bulk package of 100 yellow anchors (see above image.) They fit perfectly in the chamber of any of my .22LR pistols. I do find that I must change the anchors out more frequently (due to rim cracks and breaks) than my more-expensive snap caps, but no cost concern. The repeated absorption of all the firing pin energy takes its toll, but this is true with the plastic and spring snap caps as well. Will not using snap caps or anchors immediately destroy your gun? Probably not, but why take a chance for only $5. for 100 anchors or low-cost snap caps. Some use spent casings, but they do not seem to hold up as well and, again, a small price to pay for anchors. I hope my practical ideas for these 4 special handgun concerns have helped you at least consider some possible solutions that are best for you. These tips are not for everyone and for every gun, but will serve to get you thinking about some options that just might work. Maybe you have some other ideas to share and help folks. As always, be safe when trying any of these options and ideas. Safety First Always! Continued Success! Louisiana- (Ammoland.com)- You already know that we have the human right to defend ourselves. Let’s say you have met the all the legal requirements to carry a firearm in public. You’ve finally joined the ranks of 13 million other US citizens who carry. What comes next? What is morally required of you to be a responsible gun owner now that you have your permit? Since concealed carry is a right, I’m not advocating stricter legal requirements. I’m asking you to think about the practical responsibility we assume as we carry a gun. What comes next after you have the government permission slip? 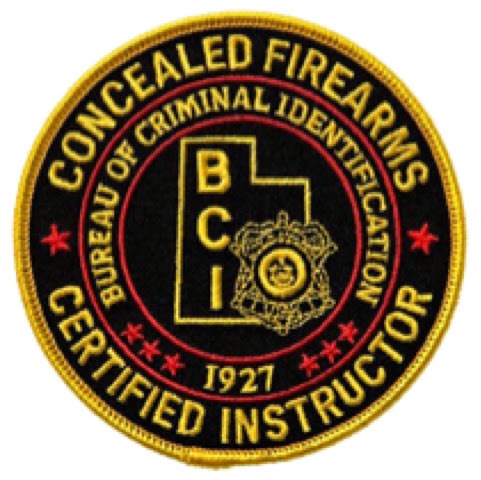 Many states require a simple course in basic firearms safety to receive your license. That means you were told how to safely handle a gun.. at least once. I hope you remember those rules. I want you practice them because firearms handling is a perishable skill rather than an abstract idea. Being safe with a firearm is a matter of developing and maintaining safe habits. There are additional skills you should develop that go beyond safe handling of a firearm. That doesn’t mean that you ignore or “outgrow” the safety rules. It means there are skills you need to effectively defend yourself and those you love. I’m not saying this as some high speed ninja-competitor, but rather as an old, slow, self-defense dinosaur. Here are a few of the skills you need, now that you carry concealed. You need to be able to quickly and safely present your firearm from a concealed holster. You don’t have to be up to competition standards, but you have to develop your skills so you can smoothly present a firearm without thinking. You need to present from concealment even if you often carry off-body in a purse or bag. Presenting from concealment is a very different activity than methodically shooting a gun from a bench at a shooting range. A professional instructor explains and demonstrates presenting a loaded firearm from concealment. The instructor watches as you demonstrate the skill. The instructor gives you feedback before you practice on your own. Learning is easy IF you are willing to be corrected and learn from your mistakes. “Presentation” is neither required for most carry licenses, nor should it be. Then again, that license in your pocket isn’t much good if you can’t safely and quickly present a loaded gun. Experience shows that physical attacks happen quickly. Most of us can shoot quickly or accurately, but not both at the same time. There are shooting exercises that push us to shoot accurately. Others, train us to shoot fast. Developing your skills is only part of the purpose of these exercises. These exercises help you recognize when accuracy is paramount or when speed is most important. It is your experience that counts. What is an easy shot for you may require time and concentration for me. Most self-defense incidents occur at a distance of under three yards and take less than three seconds. That is far different from the target shooting we’re used to. We should be moving as we draw. If the distance is close enough, we should not need to align the sights of our handgun for the first close-in shots. We didn’t learn about close-contact shooting in our concealed carry classes. But this is the typical situation we’re likely to see in a self-defense situation. Using lethal force for self-defense will be stressful. Stress also makes fools of us all. We can learn to handle measured amounts of stress as we train. Forget the Hollywood or military idea of training with an instructor yelling at you. At first the stress may be as simple as shooting while an instructor corrects your performance. Later, it will involve shooting while you are timed. Criminals don’t want a fair fight. They don’t fight one on one. The average number of attackers is 2.3 That means we have to look for the other guys after we present a firearm. If you have not done it yet, let me tell you that is hard to take our eyes off a threat.. even if the “threat” is a cardboard target. That is why we practice moving to a safer position and looking around. You have to look behind you without waving a gun around. That is another thing you’ll learn and demonstrate in a class. We don’t always get the fight we want, but we have to meet the challenges we’re given. We have to learn to shoot the gun one handed because we might be holding onto a loved one with our other hand. We might not have time to put a child into a safe place before we defend them. Are you effectively disarmed because you picked up a baby? Normally, we practice shooting while we stand upright, but we’d really rather be crouched behind a concrete column or kneeling behind a planter. We are likely to be attacked at night so it is important to learn how to hold and use a flashlight while we have a gun in our hand. The advantage of these defensive positions might be enough to end a fight before it begins, so it is important to learn and practice them. 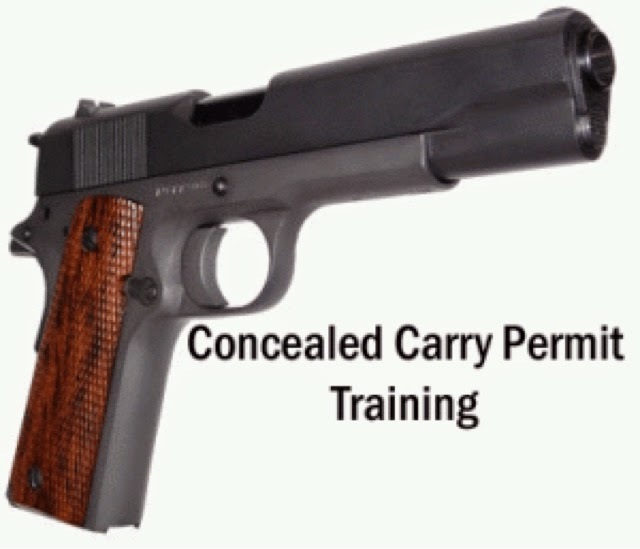 These are a few of the skills you want to have now that you have a license to carry concealed. These skills don’t require great athletic strength or speed. All of them require practice. Skills like these are easy to learn from a good course.. now that you know they are out there. One of the best things about a training courses is meeting responsible firearms owners who take training and practice. The two days after you’ve been involved in a lethal force encounter will be as trying as any you’ve likely endured. Like all things self-defense, it’s better to consider your options now than to wait until it might be too late. » YOU’VE TRAINED FOR THIS DAY. The crossroads of danger and preparation have intersected, and you’ve ended the life of someone who threatened yourself, your family or your home. After the shooting stops and the smoke clears, there is a lifeless or injured body lying in front of you. In a split second, you saved a life — your own, your family’s or someone in grave danger. Guess what? You’re not out of danger yet. This is where the most uncomfortable limbo starts. Will you be charged with involuntary manslaughter, second-degree murder, reckless endangerment or a host of other criminal charges by some crusading district attorney? Or will the matter be closed as a justifiable homicide as a result of self-defense? The first 48 hours after any self-defense shooting will very likely determine whether your home is where your family is or if the state will provide you shelter in the ol’ Graybar Hotel. You’ve mentally scripted and rehearsed every angle of attack for the self-defense action you’ve taken, but have you prepared for the legal battle that could ensue? The actions described in this article are simply non-negotiable. Stick to the script or be prepared to spend enough money to put your attorney’s children through college. There is no guarantee that the advice given in this article will keep you out of jail, but it should greatly improve your odds and force any hot-shot district attorney to consider whether it’s worth the time, money and judicial resources to attempt to get a conviction when your actions can be reasonably justified. The following steps are designed to avoid arrest, an indictment by a grand jury or, the most humiliating of all, a ruinous civil suit by the family of the lowlife perpetrator who’ll claim that you used unnecessary and deadly force to stop their kin from making you a crime statistic. Let’s work through this chronologically. Your immediate actions here are some of the most important elements of any judicial action law enforcement might decide to take. According to any number of statistical sampling, the average response time for the police to appear is between 8 and 11 minutes. During this time, you need to clear your head and take some critical mental notes. First, holster your weapon when police arrive. The last thing you need is a police officer walking onto the scene, seeing you with a drawn weapon and shooting you before you have time to proclaim your innocence. Make sure you can also tell police where the perpetrator’s weapon is. The last thing you want is someone picking it up and leaving, thereby making you appear to have shot an unarmed person. Hopefully there will be witnesses there, so someone will have called 911. You do not necessarily want a voice record of you calmly calling the police after you’ve shot someone. Emergency dispatch operators are trained to keep you on the phone and to try to extract as much information as possible. This tape will be played nationally, so don’t give a prosecutor the opportunity to tell a jury that you were cold-blooded and clear-headed after the shooting. Make mental notes of the witnesses and their positions to the shooting and the aftermath. Create a mental grid of where people are standing. My suggestion is to look around you and pretend you’re standing on a piece of paper. Mentally divide the paper into four squares, count how many people there are in each square and try to guess how far away from you they are. The crime scene will be scoured, and the homicide detectives will be taking statements from each witness. You want to make sure someone who was 30 feet away doesn’t swear that they heard every syllable of conversation between you and the perpetrator. You want to be able to recall if witnesses were close enough to see the shooting and, if necessary, attempt to impeach their testimony. This will only aggravate the police and make you look like a suspect, or worst of all, create grounds for arresting you for hiding evidence or tampering with the scene. Some people think that handing responding officers a pre-printed card with a statement is the best substitute for memorizing your rights. Wrong, wrong, wrong. Some hotshot district attorney might try to prove that this was premeditated and that you were looking for a victim. Invoke your right to have an attorney present during questioning and wait for his arrival. If your attacker is still alive, you want to demonstrate that you’re not a stone-cold murderer. Stay still, observe and if anyone asks you if you’re OK, tell them you think you might be in shock. Don’t have any sort of discussion with bystanders or witnesses. Don’t ask if they saw the whole thing, if they will tell the police what happened or anything else. Everything that happens after the bullet left the gun is now evidence. They will start asking you a battery of questions including how many times you fired, what the other person was doing to provoke your reaction and if you are licensed to carry a concealed weapon. Don’t consent to a search (they’re going to do it anyway), and if you’re with family members, tell them not to answer any questions until they too have spoken with an attorney. Cooperate with the police to the barest minimum — but respectfully. Tell them you need to speak to your lawyer before you make any statements. (Never, ever say, “I think I need to talk to my lawyer.” This will allow them to continue questioning you.) If an ambulance hasn’t arrived, ask for one for yourself as well as the perpetrator. If the police inform you that you’re under arrest, politely but unequivocally decline to answer any questions without your lawyer present. You need to give your attorney and yourself time to react to the situation. Going to the hospital and being checked for shock, injury and any other possible reaction will help you clear your head and prepare for the days to come. If the police decide to lock you up, which is a probability, be mentally prepared to stay there until you’ve had a bail hearing. Don’t talk to any inmates if you can possibly avoid it; they would sell you into slavery to reduce their sentence. You don’t need anyone overhearing you tell your lawyer you killed a lowlife and need representation. This is a conversation that should take place face to face without any observers. Before your meeting and at your earliest convenience, write down everything you remember. Write down every detail you can remember on paper. What words were spoken? What actions caused you to draw and shoot? How long was the confrontation? How many witnesses were there? Where were you coming from and where were you going? What were you wearing? When did you and the perpetrator draw your weapons? All of this information is going to be pulled from other witnesses, so you need to have your story straight and logically formatted. If there is a trial, you might need to testify, so your attorney will rehearse with you multiple times to avoid an ambush. Killing someone in self-defense makes a great news piece. As they say in the press, “If it bleeds, it leads.” If you’re allowed to go home, you might wake up to find camera crews on your lawn, photographers looking through your windows and other gawkers wondering what happened. This is when rumors begin and the full-bore investigation gets started. Have someone in your family call the police and tell them that there are news crews trespassing on your property. If they’re on the sidewalk or the street, leave them alone. Never speak to the media or have any family members speak to them. Even if they are in your face when you leave your house, do not answer anything no matter how much they provoke you. George Zimmerman gave an interview with Sean Hannity, and the special prosecutor used it as evidence against him. Prepare to tell your story in painful detail. Leave out nothing. Your lawyer is sworn to secrecy, and she can’t protect you without knowing absolutely everything that happened. Your lawyer will call the police and ask for any information related to the incident, including witness statements, ballistics testing and whether there is an assistant district attorney now assigned to the investigation. Additionally, your lawyer will contact the police and ask if charges are going to be issued against you, whether a grand jury will be convened and if a list of witnesses is available. Realistically, none of this will be given out until actual charges are initiated, but proactive legal work might help avoid a trial. Work with your attorney to find out anything and everything about the perpetrator. She will ask for discovery if you’re charged, and it will all come out, but a running start might help reinforce the reality that you were assaulted by a repeat offender. This might sound difficult, but it is not impossible, and time is your friend here. I would recommend avoiding anyone for two weeks if possible. You want this to become old news replaced by the latest incident in order to prevent continued front-page coverage. Don’t talk to the media, police or anyone other than your lawyer about what happened. If the police decide to obtain a search warrant and look through your home for evidence, the last thing they need to see is a gun sitting on the kitchen table without a trigger lock on it. Get on the Internet and double check what the legal requirements are for proper storage of a firearm in your state. You don’t want a prosecutor who is unable to prove a case to use your carelessness as evidence of reckless endangerment. Within 48 hours of the shooting, the police will have finished with the crime scene, and evidence will be collected. Toxicology reports will be started on the corpse of your attacker. If you were arrested, bail will likely be arranged by this time. If you haven’t been charged, you’ll be at home staring at the walls wondering what to do next. The police are investigating, your lawyer is probably speaking to contacts to see if you’re going to be charged or indicted and you feel as if your life is in the hands of people who don’t understand that only one person was going to walk away from the worst night of your life. Thank God it was you. Your next move is to begin your own investigation. Any questions, requests for information, freedom of information requests, etc., cannot be seen emanating from you. Have a trusted friend, spouse or relative begin to build a case against the perpetrator. Go online and do a criminal check on him. The Internet has a host of sites where you can find criminal records. Start to put together a matrix based on your search of Facebook or any other social media site of this person’s friends and contacts. Did they post a picture of themselves on Facebook pointing a gun? Are people they associate with on the web as well? Remember, if the district attorney is going to prosecute you, they will be doing the same to you. This effort will save you the money you would have to pay your attorney or a private investigator to research. Even if you’re charged and found innocent at trial, legal bills will grow very quickly. You can never tell what your attorney might miss, so protect your own interests. Send out freedom of information requests for lab results, the 911 message, police tapes, etc. You might not be a lawyer, but this is all information that will be critical to your defense should you need one. Share the information with your lawyer as soon as you receive it. Your goal is to get this done as soon as possible in order to begin a strong argument against indictment. Once again, don’t tell your story to anyone but your lawyer or your spouse. Neither can be forced to testify against you, but anyone else is fair game. Stay calm, stay focused and gradually ease back into your daily routine. This will be on your mind for months, if not years, to come, but right now, you need to reinforce the narrative that you’re the victim. Keep your head up. You trained for this day, and you successfully defended yourself. Now comes the second phase, where you need to prove it was justified.